1 September 2016. The funding from the European Commission of the PAEPARD project and platform which started in 2007 will come to close at the end of 2017. It is thus time to draw lessons on what was achieved. This first number of a serie of 3-monhtly newsletters intends exactly to do this: highlight major achievements while not shying away from drawbacks. 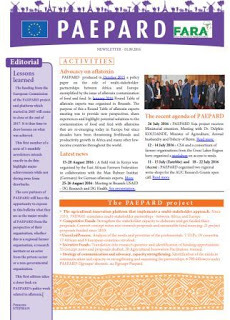 The core partners of PAEPARD will have the opportunity to express in this bulletin what they see as the major results of PAEPARD from the perspective of their organisation, whether this is a regional farmer organisation, a research institute or an actor from the private sector or a non-governmental organisation. This first edition takes a closer look on PAEPARD’s policy work related to aflatoxin.